Ecosystems services: what are they and why are they so important? Ecosystem services are services provided by natural capital (“Nature” or “the environment”- see “Explanations”) that support life on earth and are essential to the quality of human life and the functioning of the world’s economies. For example, forests help purify air and water, reduce soil erosion, regulate climate and recycle nutrients. Ecosystem services are the benefits provided by ecosystems that contribute to making human life both possible and worth living. Examples of ecosystem services include products such as food and water, regulation of floods, soil erosion and disease outbreaks, and non-material benefits such as recreational and spiritual benefits in natural areas. The term ‘services’ is usually used to encompass the tangible and intangible benefits that humans obtain from ecosystems, which are sometimes separated into ‘goods’ and ‘services ‘. The use of the term “natural capital” is developed from “capital” used in economics and human financial systems. It is a means of drawing human and environmental systems closer together and to encourage more integration in thinking and practice. Some have said that ecosystem services thinking is a means of placing a monetary value on “the environment”, although the mechanisms are currently imperfect and incomplete. In terms of “Nature”, an ecosystem is a biological community of interacting organisms and their physical environment; for example, “the marine ecosystem of the northern Gulf had suffered irreparable damage”. In broader, “non-natural” terms, an ecosystem is a complex network or interconnected system; for example, “Silicon Valley’s entrepreneurial ecosystem”. Ecosystem services are the conditions and processes through which natural ecosystems, and the species that make them up, sustain and fulfil human life. They maintain biodiversity and the production of ecosystem goods. Natural capital can be defined as the world’s stocks of natural assets or environmental resources which include geology, soil, air, water and all living things. It is from this natural capital that humans derive a wide range of services, often called ecosystem services, which make human life possible. Human capital is the stock of knowledge, habits, social and personality attributes, including creativity, embodied in the ability to perform labour so as to produce economic value. Social capital broadly refers to those factors of effectively functioning social groups that include such things as interpersonal relationships, a shared sense of identity, a shared understanding, shared norms, shared values, trust, cooperation, and reciprocity. Sustainability means that a process or state can be maintained at a certain level for as long as is wanted. The concept of ecosystem services considers the usefulness of nature for human society. The economic importance of nature was described and analysed in the 18th century, but the term, ecosystem services, was only introduced in 1981 through the work of ecologists such as Paul Erlich and HE Daly. In the latter part of the 20th Century, the observation of significant and extended damage to ecosystems caused by human impacts began to highlight the ‘real’ role of ecosystem services, resulting in more study and focus. Be aware that ecosystems have different functioning levels (see figure 1) and for the sake of clear explanation, this article focuses on high level discussion. 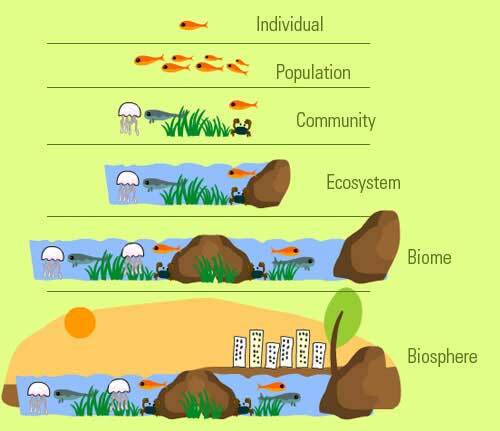 The figure demonstrates the different functioning levels that occur in typical ecosystems. Figure 2 (developed by Costanza et. al.) below illustrates the interrelationships between the different types of capital in the environment. Built capital represents the built environment (human and non-human), Human capital represents the knowledge, habits, social and personality attributes, including creativity, embodied in the ability to perform labour and Social capital represents the factors of effectively functioning social groups that include such things as interpersonal relationships, a shared sense of identity, a shared understanding, shared norms, shared values, trust, cooperation, and reciprocity, all of which are contained within Natural capital. 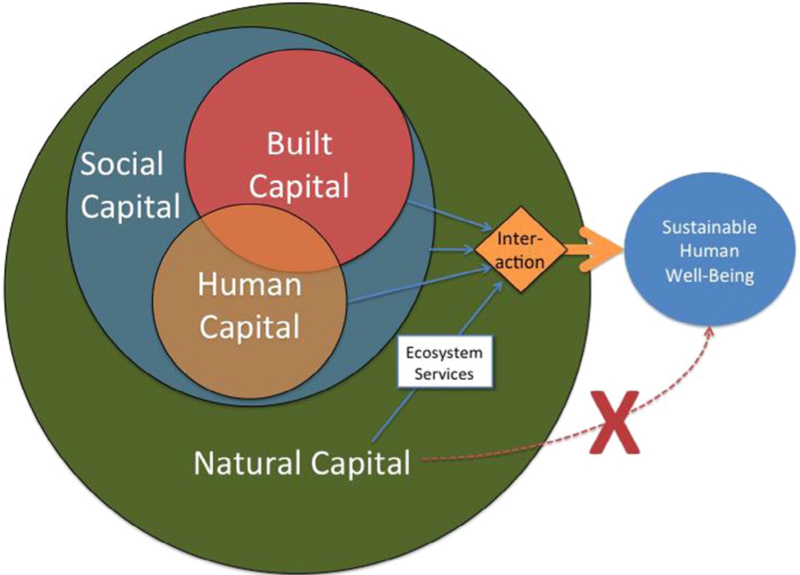 The interaction of some or all of these different forms of capital contributes towards the goal of sustainable human well-being and is enhanced by ecosystem services. ‘Functional groupings’, such as regulation (controls e.g. climate), carrier (e.g. pollination and seed transport), habitat, production (e.g. food), and information services. ‘Organisational groupings’, such as services associated with certain species that regulate external inputs into a system, and those related to the organisation of biological entities. ‘Descriptive groupings’, such as renewable resource goods, non-renewable resource goods, physical structure services, biotic services, biogeochemical services, information services, and social and cultural services. Provisioning services which are the products that are obtained from ecosystems, such as: genetic resources, food, water, fuel, bio-chemicals, fibre, natural medicines, pharmaceuticals, and building materials. Regulating services which are the benefits obtained from the regulation of ecosystem processes. These include: climate regulation, water regulation and purification, air quality maintenance, erosion control, waste treatment, regulation of human diseases, biological control, pollination, and protection from extreme weather and climatic events. Cultural services which are nonphysical benefits that humans obtain from ecosystems through spiritual enrichment, cognitive development, reflection, recreation, and aesthetic experiences. These services are connected to human behaviour and values, as well as institutions and patterns of political, social and economic organisation. Cultural services include: cultural diversity, spiritual and religious values, knowledge systems, educational values, inspiration, aesthetic values, social relations, sense of place, cultural heritage values, and tourism. Krantzkloof Nature Reserve can provide good examples to illustrate how we derive ecosystem services from our environment. The reserve has a preponderance and diversity of trees which absorb carbon dioxide and release oxygen. Managing these gases is an important function on “Spaceship Earth”. The shedding of leaves is part of the process of cycling nutrients in the soil. The recreational facilities (e.g. walking, picnicking, and relaxing) are important elements in providing recreational opportunities which assist in good physical and mental human health. To make this “sustainable”, i.e. of continuing benefit to human beings and “the environment”, it is necessary to maintain the health, diversity and carrying capacities of the ecosystems and their components by preventing their poisoning, damage, destruction or weakening. Thus, management of the reserve through protection of biodiversity, prevention of pollution, maintenance of paths to prevent inappropriate access to the forest ecosystem, control of human impacts and other proactive and reactive management activities, is part of the process of maintaining the sustainability of the reserve and its function as a “green lung”. The earth is not an “infinite resource” and it is important to recognise that polluting or damaging our “Spaceship” or not respecting its needs and limitations could have significant impacts upon its ability to sustain our lives in the future. As the earth’s human population continues to grow exponentially, future problems affecting the survival of human beings can be expected as various ecosystems services begin to break down, fail and become less sustainable. Ecosystem management, in some cases, may lead to possible ecosystem disservices. Examples of disservices can include: increased prevalence of allergens; promoting invasive species; hosting pathogens or pests; inhibiting human mobility or safety; bringing about cultural and psychological effects that negatively impact human well-being; or increasing the necessity for using natural resources (i.e. water) or chemicals (i.e. pesticides and fertilisers). Some ecosystem services involve the direct provision of material and non-material goods to people and depend on the presence of particular species of plants and animals, for example, food, timber, and medicines. Other ecosystem services arise directly or indirectly from the functioning of ecosystem processes. For example, the service of formation of soils and soil fertility that sustains crop and livestock production depends on the ecosystem processes of decomposition and nutrient cycling by soil micro-organisms. Some scientists have advocated a stricter definition of ecosystem services as only the components of nature that are directly enjoyed, consumed, or used in order to maintain or enhance human well-being. Such an approach can be useful when it comes to ecosystem service accounting and economic valuation. This is because some ecosystem services (e.g. food provision) can be quantified in units that are easily comprehensible by policy makers and the general public. Other services, for example, those that support and regulate the production levels of crops and other harvested goods, are more difficult to quantify. If a definition based on accounting is applied too strictly there is a risk that ecosystem service assessment could be biased toward services that are easily quantifiable, but with inadequate consideration of the most critical ones for human well-being. The concept of ecosystem services has prompted an increasing number of academic publications, international research projects, and policy studies. It is a subject of intense debate in the global scientific community, from the natural to social science domains. It is also used, developed, and customised in policy debates and considered, if in a still somewhat sceptical and apprehensive way, in the “practice” domain—by nature management agencies, farmers, foresters, and the corporate world. This process of bridging evident gaps between ecology and economics, and between nature conservation and economic development, has also been noted in the political arena, including in the United Nations and the European Union. Practice: Can revenue come from smart management and sustainable use of ecosystems? Are there markets to be discovered and can businesses be created? How do taxes figure in an ecosystem-based economy? The outcomes of these discussions will both help to shape policy and planning of economies at global, national, and regional scales and contribute to the long-term survival and well-being of humanity. “Ecosystems services” is a concept which may help to bridge the gap between the traditional economists (“Air soil and water are “free” goods which must be freely accessible to all.”) and multi-disciplinary decision makers (“There’s no such thing as a “free” lunch.”). After 20 years, the concept is still being hotly debated at many levels. It has perhaps resulted in the beginnings of consensus that there is need for a new economic paradigm which puts “Nature” at its core. It certainly is beginning to walk hand-in-hand with the “People, Planet and Prosperity” themes that emerged from the World Summit on Sustainable Development (WSSD) held in Johannesburg in 2002 and the subsequent UN Sustainable Development Goals. There is no doubt that current economic systems and thinking needs to be changed to cope with the 21st century issues that need to be faced. This article is designed to provide basic explanations and stimulate thought rather than going into excessive detail. 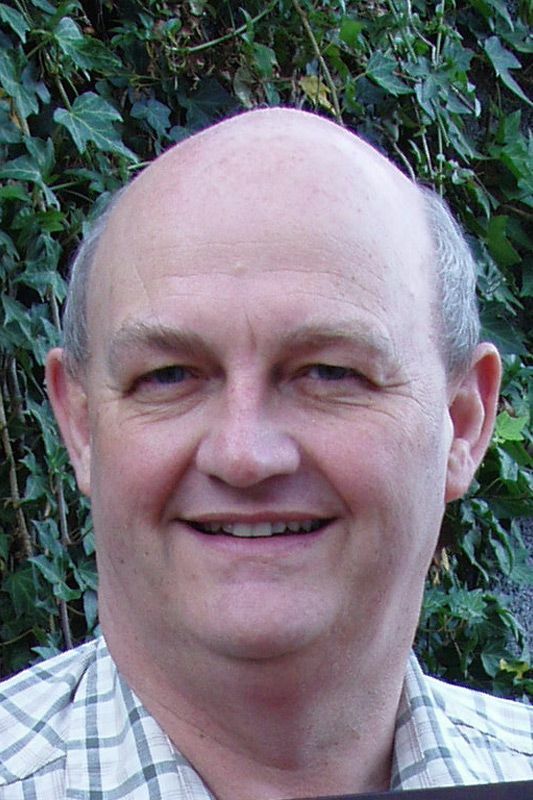 Other authors have written tomes on ecosystem or nature services and there are many academic articles of different viewpoints on this subject. For the sake of brevity, this author has applied his view on certain elements of the topic for which he takes full responsibility. If there is sufficient interest, an additional simplified reference list can be provided at a later date. Braat, L.C., Mar 2016. Framing Concepts in Environmental Science, Policy, Governance, and Law, Management and Planning, Sustainability and Solutions, Online Publication. Brundtland Commission, 1987. “Report of the World Commission on Environment and Development”. United Nations. Costanza, R., de Groot R., Braat L., Kubiszewski I., Fioramonti L., Sutton P., Farber S., and Grasso M., 2017. Twenty Years of ecosystem services: How far have we come and how far do we still need to go? Ecosystems Services, 28, 1-16. Daly, G.C., 1997. Nature’s Services: Societal Dependence on Natural Ecosystems. Island Press. De Groot, R.S., Wilson, M.A. & Boumans, R.M.J., 2002. A typology for the classification, description and valuation of ecosystem functions, goods and services. Ecological Economics, 41, 393–408. Norberg, J., 1999. Linking Nature’s services to ecosystems: some general ecological concepts. Ecological Economics, 29, 183–202. Moberg, F and Folke, C., 1999. Ecological goods and services of coral reef ecosystems. Ecological Economics, 29, 215–233. Tyler Miller, G & Spoolman, S.E., 2018. “Living in the Environment”. 19th Edition, Cengage Learning.